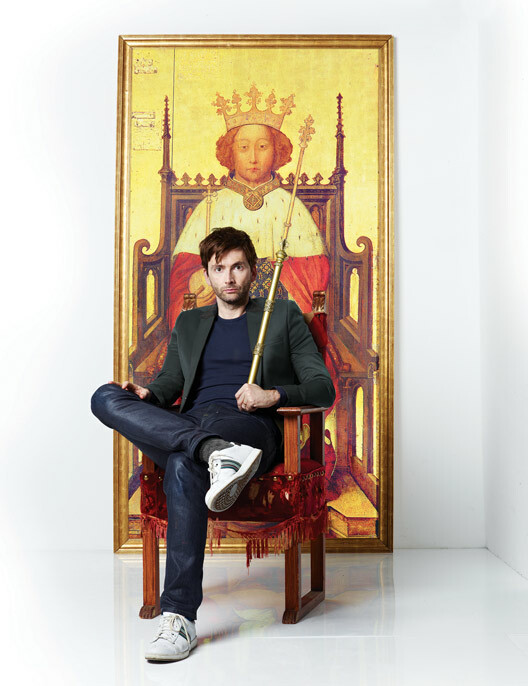 Vickster51Corner – Page 46 – Talking about all my favourite things – Theatre, TV, Film & Books! Sunday 11th July 2010 will always be a special day for me for two reasons. It was my first visit to the National Theatre and it was the day I first saw After The Dance. I quite literally fell in love with the production, so much so that, with encouragement from a friend, I queued up for day seats for the final performance. Being on the front row of the Lyttelton for that last performance in August 2010 will be an experience I will never forget and always cherish. Over three years later and I thought it was time to relive such a special production and today I visited the National Theatre Archive at The Cut in London to watch the production all over again and explore the background material made available. This was my second visit to the Archive and I think it’s a wonderful facility offered by the theatre, as you don’t have to be a student or theatre professional to go. You simply need to have a genuine interest in the production you want to see and be respectful of the rules when you are there (no photography or recording, no food or drink in the viewing area and no pens, only pencils). The staff are very friendly and helpful and when I arrived the production was loaded on a monitor and ready to go, with the box full of additional materials next to it. Mainly to make the experience of seeing the production last, I first turned to the box of materials. These provide a vast array of information about the creation of any production. I was able to read through the rehearsal script from April 2010, the Press Night blocking and cueing scripts, details of the props, production schedule, music and much more (there is even a “smoking plot” highlighting all uses of cigarettes in the production). The rehearsal notes were particularly interesting as they revealed insights into the thought processes of the actors when considering their characters – Benedict Cumberbatch requested his hankerchiefs be monogrammed and his lighter be a “Dunhill” style lighter and Adrian Scarborough had requested a distinct glass for his character to use throughout. The notes also make you realise how much thought and detail happens to bring a production to life and the production schedule highlighted how long the days could be, for example on the day of the first evening preview on 1 June, work started at 8:00 a.m. and there was a full dress rehearsal from 2:30 in the afternoon. As for the production itself, after seeing it for the third time three years on it remains for me the greatest production I have seen to date. After The Dance was Rattigan’s second play, following the success of French Without Tears and opened in June 1939 to critical praise. However weeks after its opening, the outbreak of World War II caused the play to close early due to the changing mood, which Rattigan wrongly saw as a reflection on the play itself, resulting in him choosing to omit it from his first collection of plays. This meant that over time the play was somewhat forgotten, which made Thea Sharrock’s revival at the National Theatre all the more significant. 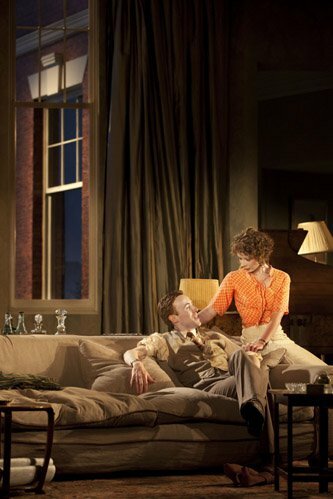 I have seen commentaries about Rattigan which refer to The Deep Blue Sea having the greatest depth of all his plays, but personally I think After The Dance is more than a match for it and for me it has the greater emotional impact. The play is a beautiful observation of a specific era in time, set just before the Second World War, which is on the horizon but not yet a certainty. In that moment it shines a light on two very different generations, the younger generation born during or just after World War I, and the slightly older hedonistic generation, who came to maturity in the aftermath of the war and whose attitude to life and to the responsibilities they have to society are very different. These two attitudes are brilliantly brought to life by David and Joan Scott-Fowler, in whose plush Mayfair apartment the play is set and their friends, who have spent their lives on an endless circuit of parties, drink and drugs, never worrying about the wider world. Peter, David’s cousin and his fiancée Helen highlight how the world is changing. Peter is determined to make something of himself and find a good job to earn an honest living so he can marry Helen – he epitomises a generation which the Scott-Fowlers crowd see as a far more boring one than their own and referring to situations and people as being boring, or being afraid to appear boring are common themes throughout the play. At its heart however the play is about love – the sadness of loving the wrong person, loving someone who you do not think loves you or to whom you dare not admit your true feelings or loving someone enough to realise the best thing for them is to walk away from them. It is this aspect of the play which has such an impact on me and very few pieces of theatre I have seen have moved me quite so much. It is difficult to explain why the production is so wonderful, but I think it is due to a number of elements. Firstly, the entire ensemble is superb, which elevates the production to another level of quality and quite frankly the central performances are outstanding. John Heffernen (currently playing the title role in the National Theatre’s Edward II) and Faye Casteloe are wonderful as the younger generation, somewhat perplexed by the attitude of the older characters. Adrian Scarborough is a joy as John, the loyal friend of the Scott-Fowlers, who so convincingly plays both the comedic and emotionally moving moments and his Olivier win was much deserved. Benedict Cumberbatch, in his debut for the National Theatre (still unknown to the wider public at that time) is superb as David Scott-Fowler, displaying each emotion perfectly. I still find it incredible how he seems to transform into someone so much older than himself in this role. As David Scott-Fowler he not only looks older, but through his voice, mannerisms and the way he holds himself, you cannot quite believe it is the same person. The final act requires a great deal of emotion from him and he conveys it all superbly and you can’t take your eyes off him for a moment. Then there is the sublime Nancy Carroll (who was the reason I booked my ticket in the first place). She is simply breathtaking in this role – bringing to life in Joan a woman you root for, who has hidden her true feelings of love for her husband for so long, for fear it will make her boring in his eyes. You so desperately want her to be happy. Nancy wonderfully brings to life the comic fun side to Joan, particularly in her interactions with John, but it is the heartbreaking moments in which she is most astonishing. In one scene, she simply stands for what feels like an eternity with her back to the audience and although you cannot see her face, you feel the emotion from her – you cannot fail to understand what Joan is going through in that moment and it had me in tears. Then there is her last scene with Benedict (which I won’t spoil for anyone still hoping to view the production), which is so simple and yet so beautiful. There are few words, and these two talented actors don’t need them to convey the feelings of each character in that moment. I could watch that scene forever. 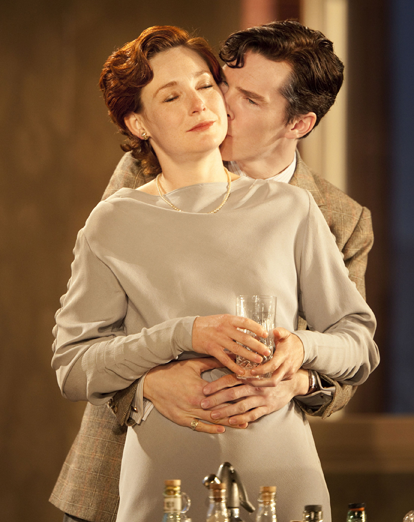 I was thrilled Nancy won an Olivier for her role and do still feel that Benedict should also have won. The play is obviously superbly constructed by Rattigan, who brings the world in which the characters live to life so vividly and I found it thrilling that at the beginning you think you understand what the play is about and how the plot will progress. However, as the carefree attitude to life starts to be revealed to be a façade, the true sadness of the characters becomes all too clear, transforming the play in to a heartbreaking look at a couple who have never truly understood each other and how much they mean to each other. 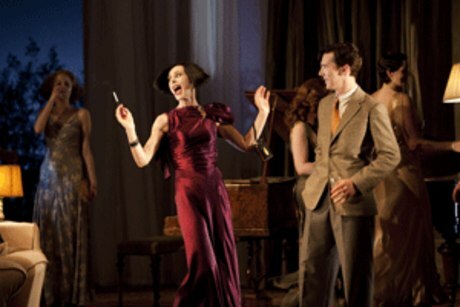 This production, directed by Thea Sharrock, who took a risk suggesting that it be revived at the National Theatre gets everything right, not only the acting, but also the set that is so stunning you wish you could live there and the costumes (especially for Joan) and music. At a recent platform event Nancy Carroll chose this as one of the productions most special to her from her career at the National Theatre and it isn’t hard to understand why. I intend to see many more plays and productions in the years to come and hope some will touch me emotionally just as much as this one. What is certain though is that I will definitely return to the brilliant National Theatre Archive again and that today won’t be the last time I see this powerful production. I would recommend that you do the same! 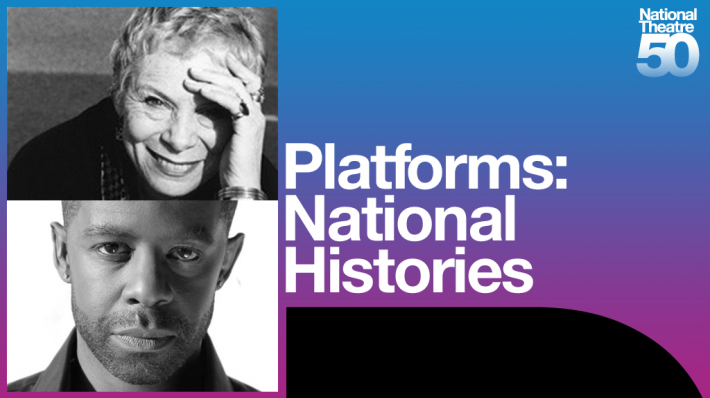 Tonight’s platform saw Sara Kestelman and Adrian Lester (fresh from his role in Othello) share their memories of the National Theatre, as part of the venue’s 50th anniversary celebrations. The format for this series of platforms is simple – each actor is asked to consider the same questions, which are then shared with the audience during the event. Sara Kestelman has a long history with the National Theatre, performing in Hamlet, Copenhagen, Square Rounds, Dalliance, The Threepenny Opera, Love For Love, Undiscovered Country, As You Like It, The Double Dealer, Bedroom Farce, State of Revolution, The Lady From Maxim’s, Strife and All About Me. Adrian Lester has of course just finished playing Othello in the Olivier theatre, took the title role in Henry V and played Anthony Hope in Sweeney Todd. Question 1 – What were your first memories / experience of the National Theatre? Sara’s first memory of the National Theatre is seeing Uncle Vanya, directed by Olivier and starring Michael Redgrave, at the Old Vic in 1963. She spoke warmly of Michael’s extraordinary vulnerability in the production. Adrian’s first memory occurred when he moved to London to attend drama school in 1986. He only knew one route from South London to Gower Street and so bought a travel card and wandered around getting to know the city and ended up walking along the Southbank on a Sunday afternoon. The National Theatre was closed, but he spoke fondly of peering through the windows of the building, reading the posters of the productions. He remembered that the building was empty, still and capable of anything at that moment. He also of course said that, starting out as a student, he did wonder at the possibility of performing there one day. Question 2 – Who is/are your unsung heroes of the National Theatre? Sara spoke about the wonderful Michael Straughan, former box office manager at the theatre, who she said knew everyone in the building, both actors, staff and audience members alike and was incredibly generous with his time. She said he was sorely missed from the building. Adrian spoke of the wonderful job done by the stage door and security staff and that they do far more than their job description. He recalled his first call from the stage door when they asked “Is Mr Adrian Lester there? There are guests for him.” On his reply that he was Adrian Lester, the stage door responded “if you could tell Mr Lester if you see him that his guests have arrived.” He recalled how at first he didn’t understand what they were doing, until he realised they were speaking in that way in front of whoever had asked for him in case he did not have guests he was expecting! He also spoke about how they lock up around you and accommodate you. Question 3 – Which individual performance at the National Theatre has left a lasting impression on you? Sara’s choice was Michael Bryant. She hilariously spoke of how naughty he could be, for example holding up signs in the wings saying “5 out of 10”. Both Sara and Adrian also spoke about “the Bryant spot” on the Olivier stage, a spot at which the actor can hear the acoustics perfectly in the theatre. Adrian described the incredible feeling of hitting that spot during the scene where he approaches Desdemona to kill her and how even though the lines were whispered, he could hear them perfectly because of the acoustics in that spot. Adrian also had Michael’s old dressing room during Othello, which only ever has a piece of paper with your name on the door, next to a plate with Michael’s name. Adrian’s own choice was Julia McKenzie, who he worked with on his first production at the National Theatre in 1993’s Sweeney Todd. He recalled observing her rehearsing the song where Mrs Lovett first sees Sweeney Todd and how she went over and over it, ensuring each motion and action matched the song perfectly. He spoke of going to the very back of the Cottesloe space during tech week to watch her do this again and seeing how each action, no matter how small, was conveyed perfectly and how incredible that was to him. 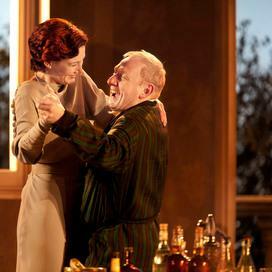 Question 4 – What was the most fulfilling National Theatre production you have been a part of? Sara said this was a very difficult question and referred to The American Clock and Copenhagen, which was an extraordinary event. However she chose 1978’s The Double Dealer, directed by Peter Wood and starring Ralph Richardson. She spoke of how Ralph always knew how much space he needed and that that may have felt controlling to some actors but that she thought he was incredible. She said Peter was a great teacher of the text and that she had probably learnt more from him than anyone else in her career and that she was possibly more frightened of him than anyone else too! Adrian joked that he didn’t have a lot to choose from and that his choice was Othello. It was the hardest job he had done and cost a great deal emotionally, due to the emotional journey the character takes. He said how everything he had ever learnt had been put in to the character. He also spoke about how he thought it was difficult to believe how quickly Othello believes Iago’s suggestion that his wife is unfaithful during Act 3 Scene 3 and that selling that scene is so important. He also said he was still letting go of the character and although he missed it, he was relieved in part it was over. Sara, with a smile, said he would definitely play the role again! Question 6 – Which production do you most regret missing at the National Theatre? Sara’s choice was A Flea In Her Ear directed by Jacques Charon at the Old Vic in 1966, as it is a production everyone always talks about. She explained how it only had a three week rehearsal time and how difficult farce is to do – it is a dance without music. Adrian mentioned Copenhagen, 1985’s Pravda starring Anthony Hopkins and also the recent production of Frankenstein. He jokingly added that he and Rory Kinnear had promised to swap roles each night in Othello but it hadn’t quite happened! Question 6 – Which of your National Theatre costumes would you choose for a fancy dress party? Sara chose one of her costumes from Undiscovered Country, which was an all black outfit with a huge black hat. Adrian said it was an easy choice for him – his sailor outfit from Sweeney Todd, which he said seemed to be mentioned by everyone when talking about his performance in the production! Question 7 – Where is your secret / special spot in the building? Sara mentioned the balcony from the green room leading to a pass door up to the top of the Cottesloe, where she used to enjoy watching the opening minutes of the production in that space whilst waiting for her own call in one of the other theatres. Adrian said his was the route you could take from the bar in the green room under the stage, which could lead you to the entrance foyer on the mezzanine level and that he could pick guests up from the green room and take them that way to have a drink without being disturbed. He said how the security staff would simply lock up around you, as you can use your pass to go back that way and exit through the stage door without a problem. Question 8 – What would be your fantasy programming for a day at the National Theatre? Sara’s day would begin with Lark Rise and Candleford, which she said had been a wonderful promenade theatre experience. Her matinee would be David Hare’s Plenty, which she first encountered through the speakers of the theatre when it was in rehearsal and how incredible it sounded. Her evening would be spent watching The National Health by Peter Nichols. Adrian would like to start his day of theatre with Moon on a Rainbow Shawl, which he thought was a beautifully observed study of people that he’d found heartbreaking. His matinee was August: OsageCounty and he spoke of the wonderful set and how important it was to have female centric productions with strong roles for older women. On being asked whether he would see the upcoming film, he said for him the play was still very fresh and he wasn’t sure if it would translate. His evening production would be by the physical theatre company DV8 entitled Just For Show, in which the performers displayed how emotions can be used to effectively convey feelings through performance in a unique way. Question 9 – What makes an evening in the theatre for you? Sara spoke of her appreciation of detail and that, although she is easily moved, she needs to find truth in a production or performance, otherwise it feels empty. Adrian became visibly moved when answering this question and said for him, he can tell when an actor is lying, or busking it, or taking it easy during a matinee and that it is the use of intelligence, awareness and skill in order to share something human about yourself as an actor with the audience, using the words you have been given. He said the immediacy of sharing that real human connection and emotion was what theatre was really all about. This again was an insightful and entertaining platform event and I continue to encourage anyone interested in theatre to pop along to one of the other scheduled National Histories events. Details can be found on the National Theatre’s website and I understand recordings of past platforms in the series will be available via the website as well. The Finborough theatre’s annual Vibrant festival returned yesterday for a fifth consecutive year. Vibrant 2013 seeks to showcase new plays by talent “discovered, developed or championed by the Finborough Theatre” through a series of rehearsed readings of new full length works for the stage, performed by some of the finest actors and directors in the industry. This was my first visit to the Vibrant festival, following word of mouth in previous years and I was not disappointed. Death in Whitbridge is written and directed by award-winning playwright Alexi Kaye Campbell (whose deeply moving and thought provoking play The Pride is currently running at the Trafalgar Studios) and interestingly this was the first play written by him. This dark comedy is an eclectic mix of many different elements and emotions, from highly comedic scenes verging on farce, through the spectrum to far darker emotional moments, all of which were performed in one Act by the talented cast. Indeed the pace of the play results in changes of tone so sudden that, as an audience, you are left so surprised it’s hard to know what to expect next, which I found to be both exciting and intriguing, if not totally surreal! Set in the English idyll of Whitbridge, the play takes place in the home of Donald and Elizabeth Wallis (a double act superbly played by David Horovitch and Marion Bailey), who are awaiting the arrival of their son Fred (the terrific as usual Adam James) for Sunday lunch. Elizabeth is particularly nervous about this visit as Fred is bringing his new girlfriend Fatima and apparently has important news for his parents – oh and there’s also the matter of the spate of murders in the area and the appearance of various body parts amongst the rose bushes and vegetable patches of the Whitbridge residents! And so begins an exploration of the prejudices that exist in today’s society, and in fact far more than you expect, as this is not simply a play tackling racial prejudice but one which also tackles everything from how we feel about those of other cultures and backgrounds, to gender dysphoria (the addition of lipstick by the actor involved was a nice extra touch of detail for the evening! ), to our perception as to what really makes us a civilised society. The play highlights all these issues brilliantly through often extremely dark comedy and scenes which feel so uncomfortable that the audience (or me anyway!) was very aware that it shouldn’t really be laughing. One of the characters, a young girl of African origin (played by Natasha Gordon), repeatedly voices the mantra she has lived by as she has struggled through life – that she is somebody. Death In Whitbridge forces its audience to take a hard look at the world in which we live and whether all is really as we think it is. Through its exploration of the varying prejudices that some people live their lives by (whether they realise it or not), the play highlighted to me that, sadly, through some people’s eyes, not everybody is somebody and only those people they can understand and feel akin to really matter to them and that in fact our society, which we like to believe is multi-cultural and open minded and an example of the civilised world, may actually be far less civilised than we would all like to admit. There may possibly be slightly too many issues tackled here, although perhaps in a full production (possibly with two Acts, as this reading was far longer than the billed 75 minutes) certain elements may not seem as rushed. I particularly thought that the final section of the play felt a little too hurried. However, the reading was performed superbly by the cast, with the dynamics between the Wallis family and Fatima presented brilliantly by the actors involved. It’s hard to say too much without ruining the play – suffice to say that from the moment Fred and Fatima arrive the audience knows that all is not going to go smoothly! As the play progresses characters continue to arrive and I particularly liked the Wallis’s neighbour (played superbly by Jenny Galloway) and her nephew “JC” (Ben Lamb) who has his own interesting part to play in the proceedings and the scene between him and Adam James was particularly comedic. I thought this was a fantastic experience and I sincerely hope this play is developed in to a full production one day, ideally with as many of the central cast returning as possible. It certainly left me with lots to think about, which is always the sign of a great play for me. This is definitely one to look out for in the coming years. 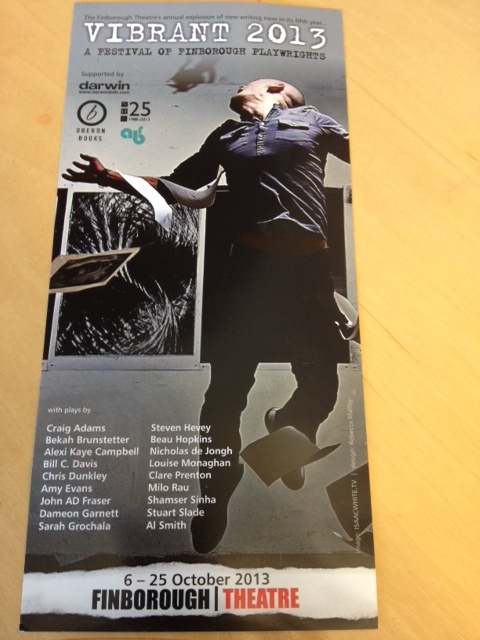 Vibrant 2013 continues at the Finborough Theatre, London until 25th October. Tickets for all seats are only £4. It’s definitely worth a visit! 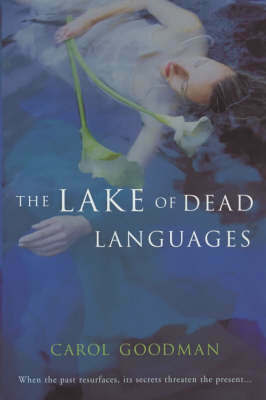 First published in 2009, this beautiful debut novel by Jamie Ford is one of the most moving and heartwarming books I have ever read. The story is told throughout from the perspective of Henry Lee, a recently widowed Chinese man who has lived all his life in Seattle. It begins at The Panama Hotel, which once was the gateway to the city’s Japantown (and indeed still stands today), where the new owner has made an astonishing discovery in the basement of the premises – boxes upon boxes of possessions belonging to Japanese families, hidden there when they were forced to leave the city during World War II and sent to internment camps. As the crowd gathers, including Henry, the owner opens a Japanese parasol. This simple gesture transports Henry (and us with him) back to 1940s Seattle when, as a young boy sent to the exclusive elementary school at which he is one of the few non-White students, he meets a young Japanese girl called Keiko Okabe and a strong bond of friendship is formed. This wonderful novel takes us in to their lives at a time when such a friendship with anyone Japanese would be seen as a risk, particularly by traditional Chinese families like Henry’s family and his father in particular, whose life is consumed with the defeat of the Japanese. As their story progresses, we move seamlessly between 1940’s Seattle and the present day, where Henry’s childhood story fascinates his own grown up son and helps him to learn more about and grow closer to his father, whilst providing the reader with a captivating story of love, loyalty and friendship. I don’t want to give any more of the plot away as this book should be read without too much knowledge of the path the story takes. The writing by Jamie Ford is superb, bringing to life the worlds inhabited by the characters over the different time periods so clearly, that you cannot help but fall under the spell of the story of Henry and Keiko’s childhood bond. It is also an incredibly moving book, which gave me a far greater awareness of how Japanese families were treated in America during World War II. It is frightening that such actions occurred not too long ago. Very few books have moved me quite so much as this one and I was incredibly sad when I reached the end and had to leave the world I had become a part of behind. 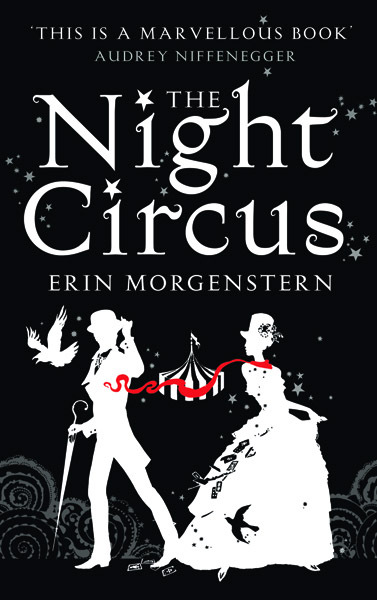 It is now a novel I recommend to family and friends and have kept myself, so that one day I can enjoy its beauty all over again. 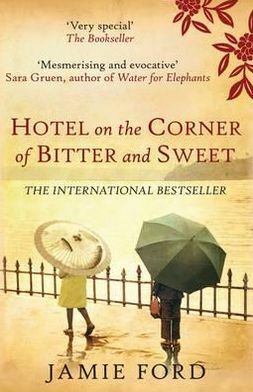 The Hotel on the Corner of Bitter & Sweet by Jamie Ford is available from all the usual book retailers.